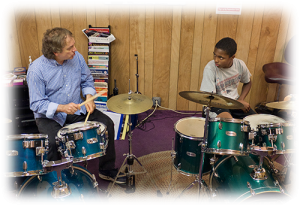 Take top-rated private drum lessons with expert instructors. Whether you’re in the school band, jazz band, your own rock band or just want to play, private drum lessons are the best way to improve your technique and take your drumming skill to the next level. All of our students sit down at a full-sized drum kit in our fully outfitted drum studio. As soon as the student is big enough to reach the ‘pedals’, we will have them working on drum set technique. This means developing 4-way coordination between the hands and feet, working the foot pedals as well as the drums and cymbals. We do teach students how to read music on the drums. It looks similar to regular written music with a lot of emphasis placed on note values and rhythm. We have drummers who start as young as 5 years old. The most important qualification is that students are able to maintain focus for a period of time. For younger students we recommend taking a one-time trial lesson before fully committing to private lessons. Start playing the drums today!